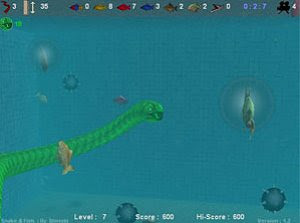 Snake & Fish is a Snake clone but in full 3D with some extra stuff! You can eat fish, but some of them are different and you have to watch out. In some levels there are underwater mines, don't touch them. Piranhas can bite other smaller fish, so those are poisoned. If you eat a poisoned fish you become poisoned too, after that you can eat fish as well, but you don't get points while you're poisoned.